If you are looking for a tent to use for family camping trips, you should consider buying a 10 man tent. Ten person tents offer a lot of space and are ideal when you want to share a tent with others. When you plan a family camping vacation, comfort is of top priority. Camping in a tent that is too small will ruin your vacation. This is why large tents, like 10 man tents are popular for family camping trips. They are nice because they usually have at least 2 rooms which provide more privacy. If you are on the market for a 10 person tent, check out the top 5 picks below. These are most popular and highest rated ones according to 10 person tent reviews. The patented hinged door on this Coleman WeatherMaster tent makes it easier to enter and exit the tent since it functions like a regular door. The rainfly provides protection from the weather while the mesh roof allows for more airflow. The continuous pole sleeves and color-coded poles make setup simple. 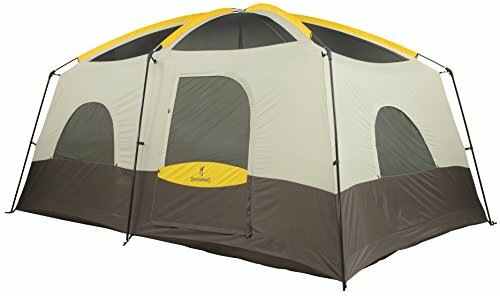 This tent has 2 doors for easy entry and exit when sharing the tent with others. You can also use the room divider to make the tent into 2 rooms. The patented welded floors and inverted seams keep water out. The windows, vents, and mesh roof provide excellent ventilation. This nylon dome tent has a pin-and-ring system pole design for easy setup. 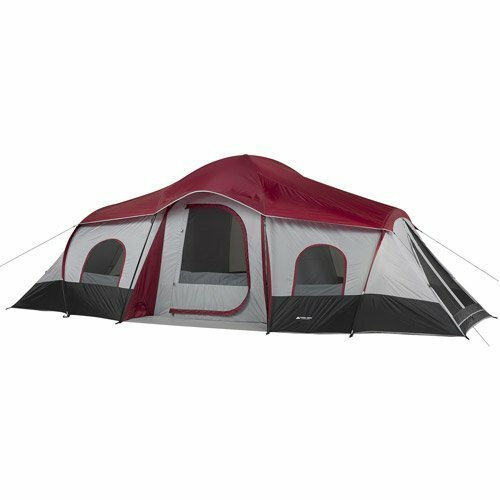 The two D-style doors make it easy to go in and out of the tent. This tent offers a large floor area, so there is room to stretch out. For ventilation, there are large mesh roof vents and windows to allow for good air circulation. The mud mats help to keep the tent clean. This tent has an integrated Stow-n- Go system which makes it easy to store. When you want to take down the tent, roll it up, and wrap the attached duffel around it. Secure it with the elastic straps and you will be good to go. Divide the tent into 2 rooms using the divider for more privacy. The extra tall center height of this Big Horn tent allows people of most heights to stand up straight when inside. This makes it more comfortable to move around the tent. The vertical side walls allow for more interior space. You can use the removable room divider to create 2 rooms. Each room has its own door to allow for easy entry when sharing the tent with others. There are extra large zippers on the doors to make them easier to open. Even though this tent is large, it uses a simple 3 pole design for easy setup. The seams in the rainfly and floor are all sealed to provide weather protection. 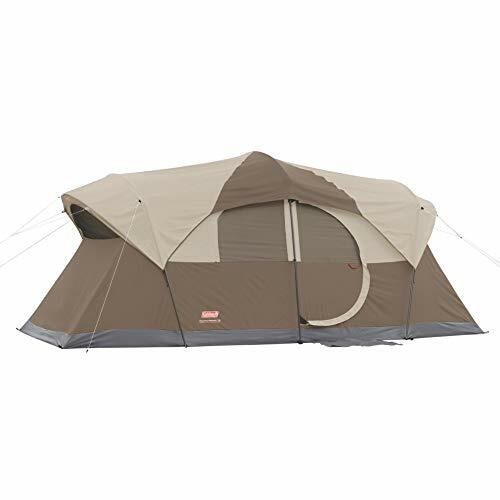 With 3 doors and 3 rooms, this tent is ideal for large families. Each room has its own door. Everyone can have their own space and can enter and exit the tent without disturbing others. The room dividers are removable if you prefer 1 large room instead. The 6 windows and 2 side doors allow for excellent ventilation and also let you enjoy panoramic views of your camping area. This spacious tent can easily fit 3 queen-sized air mattresses and there will still be room for your luggage. The seams in the rainfly are taped to prevent water leakage. For your convenience, this tent comes with a zippered carrying bag, making it easy to take along for your camping trips. This Wenzel tent comes with removable room dividers so that you can create 3 separate rooms. The four mesh windows and three mesh vents allow for excellent ventilation. The ridgepole in the fly creates an awning over the front door and rear window for protection from sun and rain. The frame is made of shock-corded fiberglass and can hold up against the wind. The tent fabric is made of durable polyester and the floor is made of welded polyethylene. You can store your small items using the storage pockets. When you want to bring your electrical appliances inside the tent, you can simply use the E-port. Ten person tents offer much more space than some other tents and make for a more comfortable camping experience. They are great for small families as well as large families. Choosing the best 10 man tent is not hard once you know what to look for. Of course, keep the top picks in mind that we listed above. The tent should be durable and provide weather protection. Multiple doors and rooms make it more convenient when camping with your family or friends. When you get a good tent, you will be able to enjoy it with your family and friends for many years.